The Yard Maxx Easy Shut Off valve is built for the professional. Our value features a heavy duty brass housing, extra large handle, 5 sided body and 1/4 turn ball valve operation. These are some of the most desirable feature requested by professional grounds keeper and landscape crews. 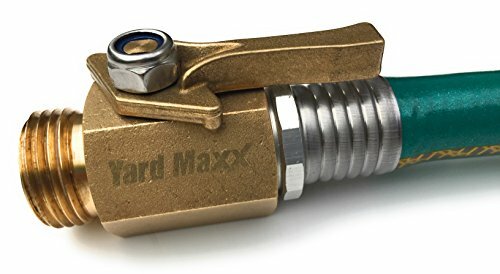 ✔ The Yard Maxx Easy Shut Off Valve is designed for the most demanding environments. Its high quality solid brass housing makes it an excellent choice for professionals. ✔ PRECISION MACHINED SOLID BRASS BALL VALVE - The Valve's Extra Large ergonomic handle is designed for single handed on/off operation. The inner mechanism is a classic BALL VALVE design, which is proven to be the most reliable valve type for maintenance free operations. If you have any questions about this product by Yard Maxx, contact us by completing and submitting the form below. If you are looking for a specif part number, please include it with your message.